There’s something about dragons, isn’t there? As both a captivating mythical entity and a literary symbol, the fire-breathing creatures have been front and center in literature for hundreds of years. Of course, they’re also big business, too, as proved by Christopher Paolini’s sweeping and successful Inheritance cycle, which began with Eragon. Bryan Davis has tapped into the dragon niche with his Dragons of Starlighter series, a young adult quartet which revisits the spiritual themes and sweeping fantasy storylines of his earlier work, including the popular Oracles of Fire series. In Liberator, the fourth and final book in the series, the story reaches its climax, pulling together the numerous strands from previous installments in a big finale. It goes without saying, though, that reading Liberator without the benefit of the first three books is a bit like showing up in the Amazon without a map or guide. One ends up lost almost instantly. But those who have been engrossed in the world of Starlighter and the quest of humans Jason and Koren throughout the series will be comfortable returning. Providing sufficient backstory in this small a space is impossible; Davis’ world is every bit as complex as Alagaesia, the land in Paolini’s series, and the mythology is every bit as intricately conceived. The action centers on Jason and Koren’s quest to free the enslaved people on the dragon planet of Starlighter. Complicating things in Liberator is a deadly disease unleashed upon humans by dragon ruler Taushin, as part of his plan to wipe humans and non-allied dragons from the planet. Jason and Koren are joined in their quest by several rebel dragons and the starlighter Cassabrie, whose allegiances to the human cause are questioned. The plot of Liberator jumps between a dozen or more characters and nearly as many settings, lingering long enough in each place to heighten the tension. The range of characters and landscapes is staggering, clearly the product of a fertile imagination and a meticulous planning process. It’s worth pointing out that in the Starlight series, Davis is continuing in a world he began to visit with previous works, especially the “Tales of Starlight” series. While the detail and complexity of Liberator is impressive, the writing is a bit more workmanlike. Davis’ prose is certainly comparable to Paolini’s and is efficient in rendering the details of the story, but is at times plodding and uninspiring. Psychological realism is also an issue in spots. Despite the fact that Jason and Koren are characters with three books’ worth of backstory, they still feel like outlines rather than complex human beings. The third person narration should enhance their realism, not lead to underdeveloped leads, but both characters aren’t quite given the sufficient amount of bone structure to develop. 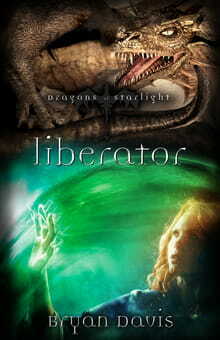 These quibbles aside, the most compelling aspect of Liberator is the way in which Davis uses the tropes of high fantasy literature – crystals, swords, shape-shifting, and, yes, even those dragons – to deal with universal themes in a symbolic way. He clearly has spent time walking in the worlds of Tolkein, LeGuin, L’Engle, and even Susan Cooper (The Dark is Rising sequence). Just as those masters were able to deal with the core issues of Christian faith and personal good/evil struggles through the language of fantasy, Davis has done so smartly and dexterously in the Starlight series. Though the language is advanced and the mythology complicated, it’s a sure bet that young readers with an appetite for these sorts of stories will hunger for more of Davis’ dragon tales.